Drop foot walking is a common factor of abnormal gait patterns in patients with stroke. Current approaches for stroke rehabilitation should include task-oriented training programmes. There is growing empirical evidence for the effectiveness of task-specific training in rehabilitation and for neural plastic changes following task-oriented training. This review aimed to discuss how should task-oriented progressive resistance training for improving dorsiflexion and gait performance in patients with stroke is planned. The effect of developing technology and better individual living conditions has caused an increasing aging population all over the world . Increasing age is the most common reason for stroke which is the major death or disability factor in adults [1,2]. Although stroke related death has declined, continue to live after stroke incidence has increased in past decades . Therefore, therapeutic methods of stroke rehabilitation have become more important in the second quarter of the twenty-first century. Neurological disorders cause many physical problems which are related with daily life activities. Lower limbs activities are necessary abilities for most these activities . One of the main goals of rehabilitation programs involves the regaining and optimizing of walking . The walking cycle is divided in two segments: a stance phase (approximately 60%) and a swing phase (approximately 40%) . Kinetic and kinematic deviations caused by spasticity, motor weakness, and abnormal motor control during these phases effect the normal gait pattern which directly influence walking speed and coordination . All these parameters are crucial to be analyzed to determine a rehabilitation program . Drop foot walking is a common factor of abnormal gait patterns in patients with stroke . Reduced dorsiflexion is characterized by dorsiflexion weakness, plantar flexion spasticity or combination of them and affected ankle dorsiflexion strength is an independent predictor of Timed Up and Go (TUG) times, accounting for 27.5% of the variance which the study included seventy-three subjects with spastic hemiplegia [9,10]. Furthermore, this kinematic deviation causes compensation which requires higher energy consumption than normal gait. Current approaches for stroke rehabilitation should include task-oriented training programmes . Task-specific training provides goal-directed repetitive practice of motor tasks to improve functional abilities . The basic principle of taskspecific training is indicated as “the best way to learn any task is to practice that particular task.” [12,13]. Tasks that important for individual, such as gait, provides meaningful neuroplastic changes in brain of stroke patients . Additionally the more practice of important task will be concluded retention and generalization of the learned motor behavior . This review aimed to discuss how should a task-oriented progressive resistance training for improving dorsiflexion and gait performance in patients with stroke be planned. How should we Assess the Patients? In order to analyze the gait kinematics of the patients, a video recording shoul be taken, with consent from the patient, of his walking. Table 1 shows the most common the kinematic deviations, the compensatory strategies and possible causes for each of these abnormalitie. Table 1: Analysis of Kinematics. Assessment of ROM is not only a crucial examination procedure but also important for treatment evaluation. Researchers used many techniques to measure passive and active ROM (e.g., goniometer, inclinometer, video recording equipments etc.). However, there is no agreement about the most reliable, functional and cost effective method to assess the ROM. Despite the fact that universal goniometer is the most common method in physiotherapy clinics, the limitations of the methods lead to improve news devices for evaluation of joint motion . Inclinometer is another widely used instrument in the measurement of joint motion. Konor et al. compared goniometer versus inclinometer using distance to wall technique. They concluded that despite both methods have good reliability and minimal fault in the results, digital inclinometer has higher reliability and lower error of measurement . However, aligning the instrument, landmark determination and examiner experience might affect reliability of results in both methods . The technology has integrated into physiotherapy departments which provide more opportunity to evaluate assessments and treatment programs. There are two kinds of applications: inclinometer-based (GetMyRom) and photo-based (DrGoniometer) (ibid). Photo-based and inclinometer-based applications are as reliable as universal goniometer and also, researchers concluded that photo-based applications suffer more objective result than others [19,20]. Ferriero et al. clearly showed that these medical heath applications might be an optional method of goniometer . Spasticity, which is defined as “a motor disorder characterised by a velocity-dependent increase in tonic stretch reflexes by Lance”, is a common indication in patients with upper neuron disorder . Spasticity is commonly measured with The Ashworth and Tardieu Scales. The original scales are revised and they are named ‘modified modified Ashworth scale’ (MMAS) and ‘modified Tardieu Scale’ (MTS). MTS is a scale for measuring spasticity that takes into account resistance to passive movement at both slow and fast speed which provide opportunity to analyze neural and non-neural components of this resistance . Hence, this study accepts that MTS is the most reliable and valid assessment to measure spasticity. The ability to objectively and reliably measure muscle strength is critical to monitor patient performance and evaluate treatment efficacy. Non-instrumental manual muscle testing (MMT) is one of the common methods to measure muscle strength which has advantage regarding with time, cost and convenient aspects . However, lack of reliability and objectivity has lead to improve this method by using isometric dynamometer. This method is called Hand-held dynamometer (HHD) which is defined reliable and relevant clinical tool for assessing muscle strength [24,25]. On the other hand, Electromyography (EMG) is also used to analyse muscle strength . Furthermore, many researchers stated that the EMG is a gold standard measurement to evaluate both isometric and isotonic strength. Despite the EMG is a gold standard measurement device, it is not seen to be practical and cost-effective method in clinics . Therefore, hand-held dynamometer might use to examine patient performance and estimate treatment effectiveness concerning muscle strength. As mentioned in previous parts, the ability to walk is commonly affected in patients with stroke. Hence, objective measurement of gait component such as speed and endurance takes important place to follow recovery of the patients. 10 meter walk test (10 MWT) is a short test which is illustrated with gait speed and also 6 minute walking test (6 MWT) provides opportunity to get information about walking distance. 10 MWT is a highly reliable and valid measurement method in patients with spinal cord injuries . 6 MWT is defined a reliable and responsive assessment procedure to monitor patient progress and also this test is also gives information about patient’s aerobic capacity . Hence, both two tests might apply the patient before and after treatment to analyze gait velocity and durability. Barthel Index (BI): The aim of the tool is to assess ‘the ability of an individual with a neuromuscular or musculoskeletal disorder to care for himself or herself’. In a meta-analyze based on 10 studies has been shown that the BI has exceptional outcome measure for stroke patients . Lower Extremity Functional Scale (LEFS): This test provides opportunity to measure ‘initial function, ongoing progress, and outcome as well as to set functional goals’ of a subacute stroke patients who has lower extremity disorders . Due to sensitivity of monitoring the changes in patients with lower extremity problems, the LEFS is a high qualified assessment tool in rehabilitation of a patient with a subacute stroke . Stroke Impact Scale (SIS): Stroke impact scale is a commonly used specific assessment tool to examine improvement of qualityof- life in patients with stroke . Cael et al. compared SIS with Barthel index and Duke Health Profile and the results were significantly correlated with the other measurement procedures. They concluded that SIS is reliable assessment for both acute and chronic stroke patients . Functional Independence Measure (FIM): This measurement helps to inform the clinicians about disability stage of patient and also how much support is essential to achieve daily life activities . In a quantitative review based on 11 studies, Ottenbacher et al. stated that FIM has adequate dependability to evaluate outcomes and to detect changes . How should we Treat the Patients? The aim of the treatment is; to improve muscles strength and coordination, to inhibit altered changes in lower extremity soft tissues, to increase gait speed and endurance by taking into consideration of cardiovascular capacity, to maximize motor performance skills and adapt daily life activities . According to the kinetic and kinematic analyze of the patient (Table 1), the objectives of the therapy should be mainly focus on reduced dorsiflexion during at initial contact which causes hip hike and circumduction gait during the swing phase as a compensation strategy. In addition, this study also considers reduced hip flexion as a secondary kinematic element. The target of therapy should be set in an agreement with patients according to their personal goals and needs. The following part includes standing balance exercises, walking training, soft issue stretching, strength training, maximizing skill, other approaches and home exercises program. Learning to balance in standing creates the infrastructure of walking ability. French et al. concluded that repetitive task training significantly improves balance and balance related activities . According to the Table 1, the patients might have difficulty to distribute evenly body weight on both extremities. Therefore, treatment program might include reaching sideways exercise to improve dissemination of weight bearing. Treatment program might be set as a task-oriented exercises approach. The patient should be in standing position and he practices reaching to pick up an object from effected side with both upper extremities (Figures 1 and 2). This activity requires distributing his body weight on effected limb and postural adjustment is also trained by reaching activity . This activity should be set 10 times repetitive in 3 sets and stopwatch might be used as a measurement tool. Figure 1: Adapted from Carr and Shepherd, 2003. Figure 2: Adapted from Carr and Shepherd, 2003. Walking training is a crucial therapeutic exercise in stroke rehabilitation. Walking training can be performed in three ways; walking on a treadmill with harness partial/non Body Weight Support (BWS), over ground walking exercises, task oriented training approach. The duration of literature exercise is stated between 20 min. to 45 min. in the literature [36-38]. However, the duration of treadmill program should be determined by the aerobic capacity of the patient. The aim of the treadmill program is; to improve velocity, slope and interval of walking ability, to increase in step length, to proceed to treadmill walking without harness, to develop aerobic capacity . 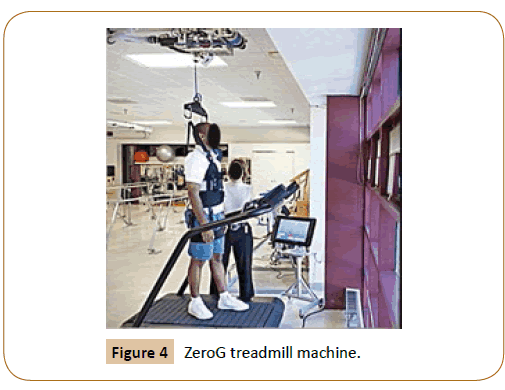 There are many supportive systems (e.g., Lite-gait, ZeroG) have been developed to provide body weight support. The results from evaluation of these mechanisms clearly shows that walking on a treadmill machine with harness help patients to improve functional and aerobic capacity . Stroke rehabilitation program should also include over ground walking activities for adapting relearned skill to daily life activities. According to the Table 1, patients usually have reduced hip flexion and hip flexion so that, walking over obstacles might help to improve these kinematic features. Jaffe et al. demonstrated that stepping over obstacles training improves walking parameters in individuals with post-stroke hemiplegia . Specific task oriented training (TOT) might be another approaches to improve reduced ankle dorsiflexion. In a systematic review, Wevers et al. indicated that the use of TOT to improve walking ability is reliable and efficient method in patients with stroke  (Figures 3-6). Figure 3: Lite Gait treadmill machine. Figure 4: ZeroG treadmill machine. 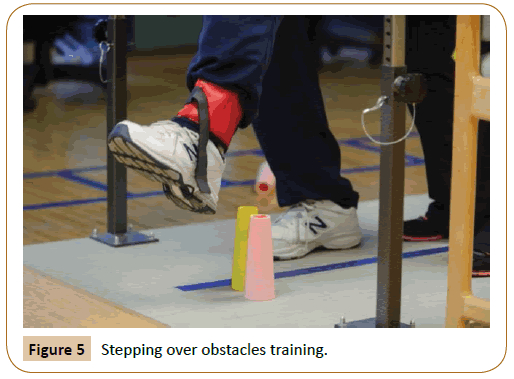 Figure 5: Stepping over obstacles training. Figure 6: Specific task oriented training (TOT) for reduced ankle dorsiflexion. Droop foot is commonly seen kinematic deviation in stoke patients which causes due to muscle weakness of ankle dorsiflexor and spasticity of plantar flexors. Therefore, strengthening exercises take an important place in stroke rehabilitation program. Dorsch et al. stated that strength of muscle group has critical relation with gait speed after stroke . Furthermore, Ng and Hui- Chan indicated that ankle dorsiflexor strength is an independent determinant of walking endurance in stroke survivors with spastic plantar flexors . The aim of treatments methods is increasing isometric, isotonic, isokinetic muscular force to regaining or optimizing walking ability. There are many approaches have been used to improve muscle force generation. Variety type of electrical stimulation (ES) has been used in rehabilitation of stroke patients. ES might be used for ‘increasing strength’, ‘decreasing contracture’ and ‘preventing a build up of connective tissue’. Functional electrical stimulation (FES) is wide spread applied method to enhance muscle force. Sabut et al. analyzed the therapeutic effects of Functional Electrical Stimulation (FES) of the tibialis anterior muscle on plantar flexor spasticity, dorsiflexor strength, voluntary ankle dorsiflexion and lower extremity motor recovery with stroke survivors . The trials were treated 12 weeks, 5 days a week, for 1 hr per day. The results from the patients who treated with FES were superior to the patients who treated same protocol except FES, in terms of reducing spasticity, improving dorsiflexor strength and lower extremity motor recovery in stroke patients . In another randomised control trial, Daly et al. investigated the effectiveness of FEM with weight-supported treadmill and over-Ground training in treatment program. They concluded that FEM might be useful to improve coordination of gait pattern if the patients are treated at least 12 weeks . According to these evidences, the treadmill activity might combine with functional electrical stimulation device. Open kinetic chain (OKC) exercise is performed by isolating one segment which provides isotonic and isometric muscle contraction. However, functionally, movement at one joint produces movement of the other joints in daily life activities. These type activities might be supplied by closed kinetic chain (CKC) exercises which explained exercises that activate all three joint (hip, knee and ankle) together. Lee et al. analyzed the effectiveness of OKC and CKC exercises on lower limb muscle activity and balance in patients with stroke . The results from their study indicated that CKC exercises provide more opportunity to improve lower limb muscle strength and balance in chronic stroke. They also stated that CKC exercises are more adaptive for daily life activities. However, it might be true that CKC exercises have more advantages than OKC exercises but, the aim of this study is primarily increasing ankle dorsiflexion . Therefore, the type of exercises should be fit for ankle joint. Kim and Yoo attempted to determine the efficacy of CKC exercise over OKC exercise in healthy women . They concluded that both type of chain exercises are equally efficient toimprove balance, increasing ankle ROM and single leg stance duration . Open kinematic chain exercise might combine with isokinetic dynamometer machine and elastic band . Despite highly diffused, the use of dynamometer or other kind of machines, specific for this exercise, may not be easily accessible or limited in use. Elastic band training is an inexpensive and easy exercise method which can be performed by patients without physiotherapist assistance. In a meta-analysis, Martins et al. clearly showed that use of elastic band in resistance training is valuable to improve muscle strength in elderly. Hence, the treatment program should include CKC exercises and OKC exercises with elastic band  (Figures 7 and 8). 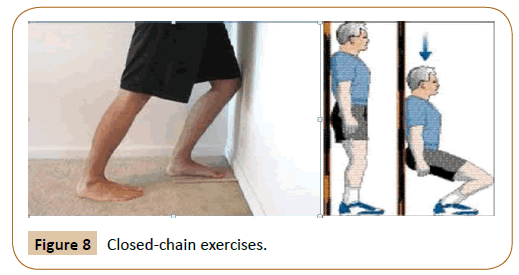 Figure 7: Elastic band resistance exercises (open and closed kinematic chain). Decrease of extensibility in soft tissues, which is especially seen calf muscles and rectus femoris, are critical to patient’s walking ability. There are two type of stretching related with muscle length. Active stretching is defined as the movement in agonist muscle helps to stretch primary antagonist muscle. Nakamura et al. indicated that active stretching of calf muscles increases the ankle range of motion . Therefore, this study recommends that kinetic chain exercises and elastic band resistance exercise for dorsiflexor, which is explained in strengthening training part, help to inhibit spasticity of calf muscles. Passive stretching is another type of method to deal with muscle stiffness. This method, which might be supplied by manually or mechanically, does not involve patient’s contribution during the stretching. However, there is no agreement about effectiveness of passive stretching. Harvey et al. evaluated the effectiveness of regular stretching in patient with neurological conditionals . They suggested that passive stretching is not valuable method to manage ROM, pain, spasticity and functional activity limitations . On the other hand, some researchers claim that passive stretching before active exercises might help to decrease muscle stiffness. Behm and Chaouachi tried to determine the acute effectiveness of static and dynamic stretching on exercise performance . They stated that short duration of static stretching might help to minimize impairment of the trainers during training period . However, there is no valuable evidence which shows relation between stretching and exercise performance in stroke rehabilitation. This area needs more researches explaining the connection between passive stretching and exercise performance. Therefore, passive static stretching might be applied for the patients to get better training performance. Orthosis is another approach in stroke rehabilitation to improve gait coordination and also, different type of orthosis can provide static stretching for the patients with stroke. Ankle Foot Orthosis (AFO) is commonly preferred external devices to cope with reduced ankle dorsiflexion whish is also named foot drop orthosis. Tyson et al. published a systematic review to show effects of AFO on balance and walking after stroke . They stated that AFO might have valuable effect on step length, weight distribution however; use of AFO has no effect on gait velocity and postural sway. In the same study there is no evidence about long-term effectiveness of AFO . In another study, Dogan et al. concluded that use of AFO shows significant improvement on balance and ambulation activities . According to evidence, AFO might be useful for the patients. Stroke which affect life quality and autonomy might persevere during lifelong. Therefore self practices at home take an important place in stroke rehabilitation. This program should create with health professionals and revise periodically based on patient improvement. Duncan et al. examine the effectiveness of home training exercises which include straightening, balance and endurance training . They clearly showed that three aspect of training significantly improved end of 8 week training program . Home programs of patients should virgül include stretching exercises, elastic band resistance exercises, and kinetic chain exercises. Home program should create with in agreement with patient and review exercises periodically to ensure progression of each exercise. The present study has aimed to review the literature in order to declare a guideline to assess and create a rehabilitation program for patients with drop foot. Current evidence suggests that kinematic features, range of motion, spasticity, muscle strength, gait parameters and some other evaluations such as activities of daily living and functional independence are crucial components of patient assessment. Results of assessments may direct a therapist to serve the best treatment option. Balance training, walking training, strengthening and soft tissue stretching and supporting the patients with orthesis when necessary seem to be effective strategies to improve drop foot related impairments. Adding home exercises to rehabilitation program will result in better outcomes. Fisher A, Martin J, Srikusalanukul W, Davis M (2014) Trends in stroke survival incidence rates in older Australians in the new millennium and forecasts into the future. J Stroke Cerebrovasc Dis 23: 759-770. Lee IH (2015) Does the speed of the treadmill influence the training effect in people learning to walk after stroke? A double-blind randomized controlled trial. Clini Rehabi 29: 269-276. Lee S, Shafe AC, Cowie MR (2011) UK stroke incidence, mortality and cardiovascular risk management 1999-2008: time-trend analysis from the General Practice Research Database. BMJ Open 1: e000269. 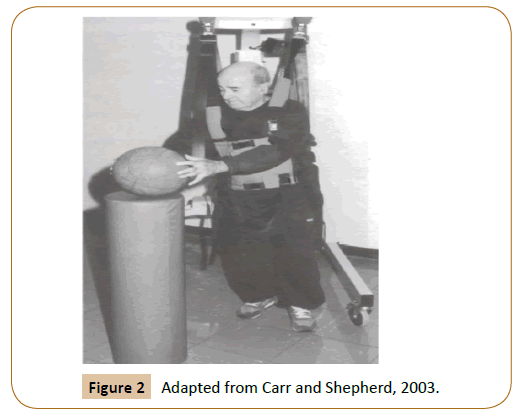 Carr JH, Shepherd RB (2003) Stroke rehabilitation: guidelines for exercise and training to optimize motor skill. Butterworth Heinemann, UK. Belda Lois JM, Mena del Horno S, Bermejo Bosch I, Moreno JC, Pons JL, et al. 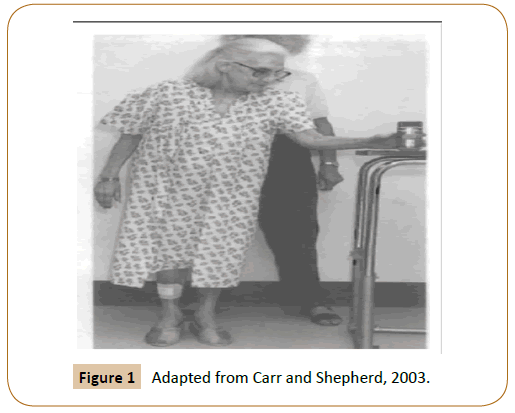 (2011) Rehabilitation of gait after stroke: a review towards a top down approach. J Neuroeng Rehabil 8: 66. Hsu AL, Tang PF, Jan MH (2003) Analysis of impairments influencing gait velocity and asymmetry of hemiplegic patients after mild to moderate stroke. Arch Phys Med Rehabil 84: 1185-1193. Ferrarello F, Bianchi AM, Baccini M, Rubbieri G, Mossello E, et al. (2013) Tools for observational gait analysis in patients with stroke: a systematic review. Physi ther 93: 1673-1685. Everaert DG, Stein RB, Abrams GM, Dromerick AW, Francisco GE, et al. (2013) Effect of a foot-drop stimulator and ankle foot orthosis on walking performance after stroke: a multicenter randomized controlled trial. Neurorehabil Neural Repair 27: 579-591. Forrester LW, Roy A, Krebs HI, Macko RF (2011) Ankle training with a robotic device improves hemiparetic gait after a stroke. Neurorehabil Neural Repair 25: 369-377. Shamay SM, Hui CW (2013) Ankle dorsiflexion, not plantar flexion strength, predicts the functional mobility of people with spastic hemiplegia. J Rehabil Med 45: 541-545. Yang YR, Wang RY, Lin KH, Chu MY, Chan RC (2006) Task-oriented progressive resistance strength training improves muscle strength and functional performance in individuals with stroke. Clinic Rehabi 20: 860-870. Narayan AK, Verma R, Garg RK, Sharma VP, Agarwal M, et al. (2012) Meaningful task-specific training (MTST) for stroke rehabilitation: a randomized controlled trial. Top Stroke Rehabil 19: 193-211. Bayona NA, Bitensky J, Salter K, Teasell R (2005) The role of task-specific training in rehabilitation therapies. Top Stroke Rehabil 12: 58-65. Daly JJ, Ruff RL (2007) Construction of efficacious gait and upper limb functional interventions based on brain plasticity evidence and model based measures for stroke patients. Sci World J 7: 2031-2045. Hubbard IJ, Parsons MW, Neilson C, Carey LM (2009) Task-specific training: evidence for and translation to clinical practice. Occup Ther Int 16: 175-189. Sidaway B, Euloth T, Caron H, Piskura M, Clancy J, et al. (2012) Comparing the reliability of a trigonometric technique to goniometry and inclinometry in measuring ankle dorsiflexion. Gait Posture 36: 335-339. Konor MM, Morton S, Eckerson JM, Grindstaff TL (2012) Reliability of three measures of ankle dorsiflexion range of motion. Int J Sports Phys Ther 7: 279. Charlton PC, Mentiplay BF, Pua YH, Clark RA (2015) Reliability and concurrent validity of a Smartphone, bubble inclinometer and motion analysis system for measurement of hip joint range of motion. J Sci Med Sport 18: 262-267. Ferriero G, Vercelli S, Sartorio F, Lasa SM, Ilieva E, et al. (2013) Reliability of a smartphone-based goniometer for knee joint goniometry. Int J Rehabil Res 36: 146-151. Mitchell K, Gutierrez SB, Sutton S, Morton S, Morgenthaler A (2014) Reliability and validity of goniometric iPhone applications for the assessment of active shoulder external rotation. Physiother Theory Pract 30: 521-525. Abolhasani H, Ansari NN, Naghdi S, Mansouri K, Ghotbi N, (2012) Comparing the validity of the Modified Modified Ashworth Scale (MMAS) and the Modified Tardieu Scale (MTS) in the assessment of wrist flexor spasticity in patients with stroke: protocol for a neurophysiological study. BMJ Open 2: 1394. Alhusaini AA, Dean CM, Crosbie J, Shepherd RB, Lewis J (2010) Evaluation of spasticity in children with cerebral palsy using Ashworth and Tardieu Scales compared with laboratory measures. J Child Neurol 25: 1242-1247. Reese NB (2013) Muscle and Sensory Testing E-Book. (Elsevier Health Sciences) Elsevier Saunders Publications Ltd, USA. Thorborg K, Petersen J, Magnusson SP, Hölmich P (2010) Clinical assessment of hip strength using a handÃ¢ÂÂheld dynamometer is reliable. Scand J Med Sci Sports 20: 493-501. Johansson FR, Skillgate E, Lapauw ML, Clijmans D, Deneulin VP, et al. (2015) Measuring eccentric strength of the shoulder external rotators using a handheld dynamometer: reliability and validity. J Athl Train 50: 719-725. Andersen KS, Christensen BH, Samani A, Madeleine P (2014) Between-day reliability of a hand-held dynamometer and surface electromyography recordings during isometric submaximal contractions in different shoulder positions. J Electromyogr Kinesiol 24: 579-587. Peters DM, Fritz SL, Krotish DE (2013) Assessing the reliability and validity of a shorter walk test compared with the 10-Meter Walk Test for measurements of gait speed in healthy, older adults. J Geriatr Phys Ther 36: 24-30. Mossberg KA, Fortini E (2012) Responsiveness and validity of the six-minute walk test in individuals with traumatic brain injury. Physither 92: 726-733. Duffy L, Gajree S, Langhorne P, Stott DJ, Quinn TJ (2013) Reliability (Inter-rater Agreement) of the Barthel Index for Assessment of Stroke Survivors. Stroke 44: 462-468. Verheijde JL, White F, Tompkins J, Dahl P, Hentz JG, et al. (2013) Reliability, validity, and sensitivity to change of the lower extremity functional scale in individuals affected by stroke. PMR 5: 1019-1025. Lin KC, Fu T, Wu CY, Wang YH, Liu JS, et al. (2010) Minimal detectable change and clinically important difference of the Stroke Impact Scale in stroke patients. Neurorehabil Neural Repair 24: 486-492. Cael S, Decavel P, Binquet C, Benaim C, Puyraveau M, et al. (2015) Stroke impact scale version 2: Validation of the french version. Physither 95: 778-790. White DK, Wilson JC, Keysor JJ (2011) Measures of adult general functional status: SFÃ¢ÂÂ36 Physical Functioning Subscale (PFÃ¢ÂÂ10), Health Assessment Questionnaire (HAQ), Modified Health Assessment Questionnaire (MHAQ), Katz Index of Independence in Activities of Daily Living, Functional Independence Measure (FIM), and OsteoarthritisÃ¢ÂÂFunctionÃ¢ÂÂComputer Adaptive Test (OAÃ¢ÂÂFunctionÃ¢ÂÂCAT). Arthritis Care Res 63: 11. Ottenbacher KJ, Hsu Y, Granger CV, Fiedler RC (1996) The reliability of the functional independence measure: a quantitative review. Arch Phys Med Rehabil 77: 1226-1232. French B, Thomas L, Leathley M, Sutton C, McAdam J, et al. (2010) Does repetitive task training improve functional activity after stroke? A Cochrane systematic review and meta-analysis. J Rehabil Med 42: 9-15. Canning CG, Allen NE, Dean CM, Goh L, Fung VS (2012) Home-based treadmill training for individuals with Parkinson’s disease: a randomized controlled pilot trial. Clinic Rehab 26: 817-826. Lee S, Shafe AC, Cowie MR (2011) UK stroke incidence, mortality and cardiovascular risk management 1999–2008: time-trend analysis from the General Practice Research Database. BMJ 1: 269. Pohl M, Mehrholz J, Ritschel C, Rückriem S (2002) Speed-dependent treadmill training in ambulatory hemiparetic stroke patients. Stroke 33: 553-558. Trueblood PR (2001) Partial body weight treadmill training in persons with chronic stroke. Neuro Rehab 16: 141-153. Jaffe J, Lowes L, Borstad A, Worthen L, Crawfis R, et al. (2014) Delivery of Constraint-Induced Movement Therapy Through a Video Game for Individuals with Hemiparesis Post-Stroke. J Altern Complement Med 20: A119-A120. Wevers L, Van I, Vermue M, Mead G, Kwakkel G (2009) Effects of task-oriented circuit class training on walking competency after stroke. Stroke 40: 2450-2459. Dorsch S, Ada L, Canning CG, Al-Zharani M, Dean C (2012) The strength of the ankle dorsiflexors has a significant contribution to walking speed in people who can walk independently after stroke: an observational study. Arch Phys Med Rehabil 93: 1072-1076. Ng SS, Hui-Chan CW (2012) Contribution of ankle dorsiflexor strength to walking endurance in people with spastic hemiplegia after stroke. Arch Phys Med Rehabil 93: 1046-1051. Sabut SK, Sikdar C, Kumar R, Mahadevappa M (2011) Functional electrical stimulation of dorsiflexor muscle: effects on dorsiflexor strength, plantarflexor spasticity, and motor recovery in stroke patients. Neuro Rehab 29: 393-400. Daly JJ, Zimbelman J, Roenigk KL, McCabe JP, Rogers’s JM, et al. (2011) Recovery of coordinated gait: randomized controlled stroke trial of functional electrical stimulation (FES) versus no FES, with weight-supported treadmill and over ground training. Neurorehabil Neural Repair 25: 588-596. Lee NK, Kwon JW, Son SM, Kang KW, Kim K, et al. (2013) The effects of closed and open kinetic chain exercises on lower limb muscle activity and balance in stroke survivors. Neuro Rehab 33: 177-183. Kim MK, Yoo KT (2017) The effects of open and closed kinetic chain exercises on the static and dynamic balance of the ankle joints in young healthy women. J Phys Ther Sci 29: 845-850.
de Oliveira PA, Blasczyk JC, Junior GS, Lagoa F, Soares M, et al. (2017) Effects of Elastic Resistance Exercise on Muscle Strength and Functional Performance in Healthy Adults: A Systematic Review and Meta-Analysis. J Phys Act Health 14: 317-327. Nakamura K, Kodama T, Mukaino Y (2014) Effects of active individual muscle stretching on muscle function. J Phys Ther Sci 26: 341-344. Harvey LA, Katalinic OM, Herbert RD, Moseley AM, Lannin NA, et al. 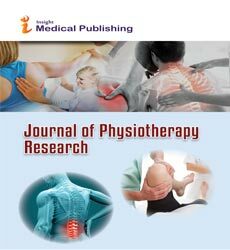 (2017) Stretch for the treatment and prevention of contracture: an abridged republication of a Cochrane Systematic Review. J Physiother 63: 67-75. Behm DG, Blazevich AJ, Kay AD, McHugh M (2015) Acute effects of muscle stretching on physical performance, range of motion, and injury incidence in healthy active individuals: a systematic review. Applied physiology, Nutr Metab 41: 1-11. Tyson SF, Kent RM (2013) Effects of an ankle-foot orthosis on balance and walking after stroke: a systematic review and pooled meta-analysis. Arch Phys Med Rehabil 4: 1377-1385. Dogan A, Mengulluoglulu M, Ozgirgin N (2011) Evaluation of the effect of ankle-foot orthosis use on balance and mobility in hemiparetic stroke patients. Disabil Rehabil 33: 1433-1439. Duncan P, Richards L, Wallace D, Stoker J, Pohl P, et al. (1998) A randomized, controlled pilot study of a home-based exercise program for individuals with mild and moderate stroke. Stroke 9: 2055-2060.